Get outdoors at Grotte di Pertosa-Auletta and Casa Grotta di Vico Solitario. Get a sense of the local culture at Sassi di Matera and Parco delle Chiese Rupestri di Matera. Explore the numerous day-trip ideas around Matera: Ente Parco Nazionale Del Pollino (in Rotonda), Chiesa Matrice (in Rocca Imperiale) and Lido Playa del Sol (in Montegiordano). There's lots more to do: contemplate the long history of Cripta del Peccato Originale, make a trip to FAI - Casa Noha, take in the spiritual surroundings of Cattedrale di Matera, and see the interesting displays at Museo Laboratorio della Civiltà Contadina. Baden-Baden, Germany to Matera is an approximately 7-hour flight. You can also drive. In April, daily temperatures in Matera can reach 20°C, while at night they dip to 9°C. Wrap up your sightseeing by early afternoon on the 24th (Tue) to allow time for travel to Forio. Get some cultural insight at Sant'Angelo (Serrara Fontana) and Basilica Di Santa Maria Di Loreto. Step off the beaten path and head to Chiesa del Soccorso and Baia di Sorgeto. Step out of Forio with an excursion to Maronti Beach in Ischia--about 36 minutes away. Do a combination of car and ferry from Matera to Forio in 4.5 hours. Alternatively, you can do a combination of train and ferry; or do a combination of bus and ferry. Traveling from Matera in April, Forio is a bit warmer at night with lows of 15°C. 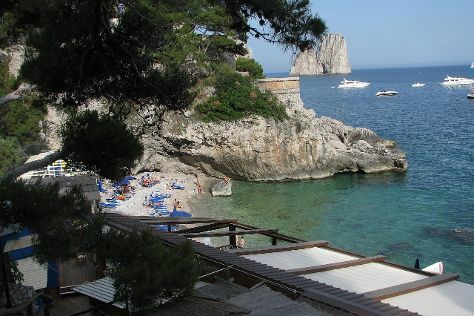 Finish your sightseeing early on the 28th (Sat) so you can travel to Capri. You'll discover tucked-away gems like Villa San Michele and Chiesa San Michele. Escape the urban bustle at Marina Piccola and Capri Rent Boats. And it doesn't end there: get outside with Capri Sea Service, enjoy the sand and surf at Marina Grande, take in the awesome beauty at Monte Solaro, and hike along Fortini Coastal Walk. Getting from Forio to Capri by combination of bus and ferry takes about 1.5 hours. In April, plan for daily highs up to 22°C, and evening lows to 15°C. Finish your sightseeing early on the 2nd (Wed) to allow enough time to ride a ferry to Naples. Naples is the capital of the Italian region Campania and the third-largest municipality in Italy after Rome and Milan. Get outdoors at Sentiero degli dei (Path of the Gods) and Vesuvio. Do some cultural sightseeing at Gli Scavi Archeologici di Pompei and National Archaeological Museum of Naples. Venture out of the city with trips to Villa dei Misteri (in Pompeii), Convento di Santa Maria a Castro (in Praiano) and Reggia di Caserta (in Caserta). There's still lots to do: explore the world behind art at Museo Cappella Sansevero, steep yourself in history at Ruins of Herculaneum, get engrossed in the history at Galleria Borbonica, and tour the pleasant surroundings at Cimitero delle Fontanelle. Plan my day in Naples using traveler tips and tourist information provided by Inspirock. Getting from Capri to Naples by ferry takes about an hour. In May, daytime highs in Naples are 27°C, while nighttime lows are 17°C. You will leave for home on the 10th (Thu).